The City of Newport News sits on a prime vantage point where the James River meets the Chesapeake Bay. The City runs approximately 25 miles along the James River and the Hampton Roads Harbor. Steeped in history, ours is a community of diverse trades including shipbuilding, technological research and international commerce. We are proud of our City and its rich heritage which dates back to the founding of America. Newport News was named for Christopher Newport, captain of the Susan Constant, the lead ship of the three ship fleet that carried the Jamestown settlers to the new world in 1607. Captain Newport made several more trips between the new world and England. After the Starving Time of 1610, the original colonists abandoned Jamestown and encountered Captain Newport in the James River and learned that reinforcements of men and supplies had arrived, thus prompting their return to Jamestown. 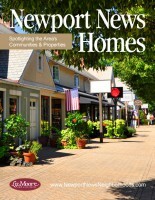 The place where that occurred became known for Newport's good news, 'Newport's News,' and eventually just Newport News. Since the turn of the 19th century, Newport News has been known as the provider of the nation's finest, technologically advanced military ships. In more recent years, Newport News has also become a center for international commerce, research and technology. Our economy is strengthened by a strong military presence in Hampton Roads and, in Newport News, we are proud to be home of the U.S. Army Transportation Center at Fort Eustis. The City's historic sites, museums and cultural facilities compliment the quality of life for Newport News residents and businesses. The City boasts 18 public parks, as well as public boat ramps and recreation facilities. Newport News Park, the largest municipal park east of the Mississippi River, has 8,000 acres along with two 18-hole golf courses. Once settled as a new resident, we know that you too will learn that Newport News is a great place to live! Download our list of reasons to love living in Newport News...and next time you're looking for a new weekend adventure - or entertaining out-of-town guests - check out one of our local favorites you've not experienced before!